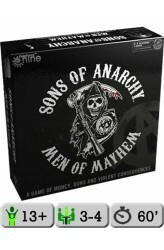 In Sons of Anarchy: Men of Mayhem, players take the role of rival biker gangs out to control territory to reap the monetary rewards of controlling contraband. With each turn, new tiles are laid, which represent new territory, and clubs attempt to control that space by placing members of their gang (represented by tokens of Members on bikes, and Prospects who are on foot) in that space. However, other players can challenge for right to territory, which will lead to conflict; negotiate, threaten and ally with rival gangs when it serves your needs, but be wary of the inevitable knife in the back. The game is about making and breaking alliances, and the gang with the most money at the end of six turns wins. https://www.youtube.com/watch?v=XPsRy3H8cWo ..